Week 20 turned out to be the best week of the season so far with 33 fish landed. It was indeed a great week finished in style with Paul Wymes landing a sea liced fish of 15lbs11ozs off Finlough. This was nearly matched by Ciaran Boland’s 14lb fish off the Meadow pool. There were also three more of similar size lost on Friday and Saturday. Following on from my last update we landed 5 fish on the 15th. 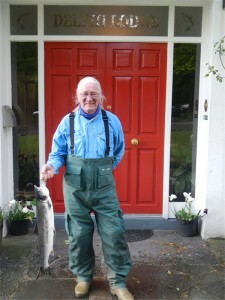 Leigh Hookes had two beautiful fish off Fin weighing in at 9lbs8ozs and 12lbs2ozs. Both were taken on an Executioner. 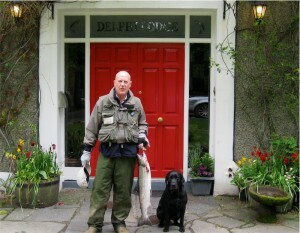 Ciaran Boland also had one off Fin on a Delphi Collie of approx. 12lbs that he performed CPR on before finally giving it mouth to mouth to revive it. Robbie Burton had a well deserved fish off Fin on a Red Assed Green Peter Muddler of 7lbs. Finally Paul Smyth had one off the Horseshoe on a Collie Dog of approx. 6lbs. 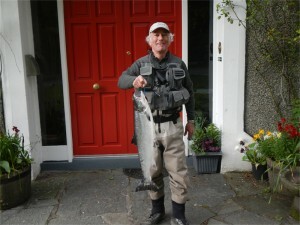 Five fish were landed on the 16th, with two off Fin the first of 5lbs15ozs on a Shrimp Fly by Peter Milne, the second Stuart Lyon (Thank God) of 7lbs10ozs on a Delphi Collie. 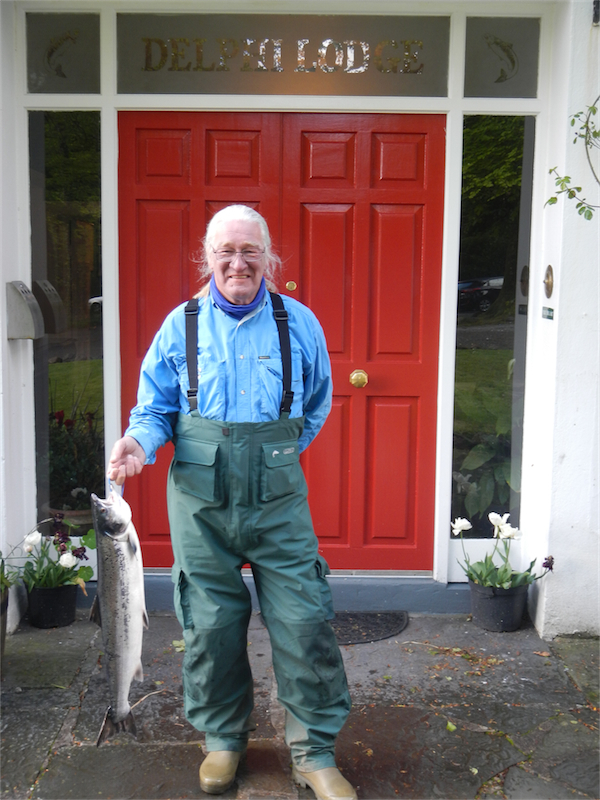 Three fish came off the river, Ciaran Boland of 10lbs7ozs from the Grilse pool on a Delphi Collie, Peter Joyce with his first of the year, 2lbs13ozs from the Rock pool on a Willie Gunn and finally Rocky Moran, Meadow pool of approx. 10lbs. The 17th saw four landed with Andy Bowman, from Total Flyfisher landing a fish of 6lbs3.5ozs off Fin on a fly named after his daughter Jenifer. Paul Wymes then had one of 5lbs8ozs off Fin on a Red Francis and then showed his class when landing the heaviest fish of the year so far of 15lbs11ozs, taken on a Black and Red shrimp fly. Then Ciaran Boland had his fish of approx. 14lbs from the Meadow on a Moonray Shadow (who comes up with the names). On the 18th Andy Bowman had our only fish from the Whin pool of 9lbs9ozs on a turbo Collie Dog (i.e. one that is stripped extremely fast). Believe it or not it was actually the 13th time a fish came to the fly before it actually took. This week Barbara Ceillier got her season off to a great start with a nice 4lbs9oz fish from the Rock pool on a Temple Dog on Sunday. Yesterday we had three, all off the river. Simon Albertini had one of 9lbs12ozs from the Waterfall on a Red Francis. John Plumb had his first Atlantic salmon from GB and Ireland from the Waterfall of 10lbs2ozs on a Willie Gunn. 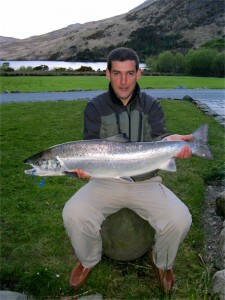 Then Steve Jones had one from the Meadow of 4lbs9ozs on a Willie Gunn. 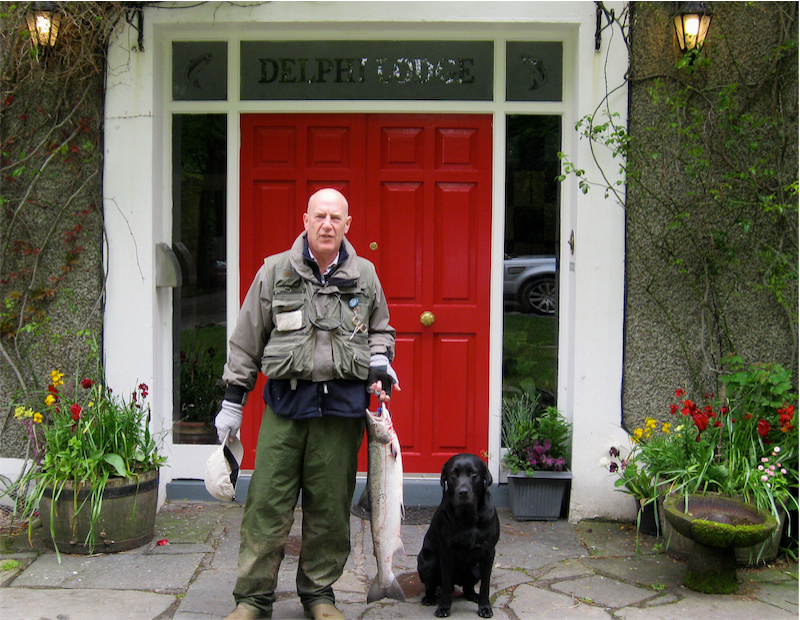 Finally today at the time of writing we have one landed, by Steve Jones again, off Finlough on Delphi Collie, weighing in at 7lbs13ozs. Water is at 37 and dropping slowly. Hopefully with a little bit of heat Finlough will start to produce some of these monsters that have been lost.